The H1 Heading Tag - What is it? What does it do? The H1 Heading Tag – What is it? What does it do? The H1 heading tag is an often overlooked component of web page optimization. In this short article we will explain what it is, where you can find it and how to optimize it to your advantage. Where is it located and what does it really look like? You see, it’s just a super simple html markup. Nothing to it really! How many times should the H1 heading tag be used on a webpage? The answer is once. Since it carries, what we call “SEO Weight”, meaning it affects search engine rankings – it should not be abused. The rule of thumb is to use it for what it was meant to be used for: The visible page title. Again: Do not use the H1 tag more than once per page. Ideally, the textual content in between your H1 heading tag should match your title tag content. However, this is not always aesthetically pleasing. With that said, try to place the keyword the webpage is about somewhere in the H1 heading if it makes sense. Don’t stuff keywords in the H1 tag that would make it unreadable. Your webmaster (the person who built your website) didn’t use H1 heading tags. How can I find out how many times the H1 has been used on a webpage? By viewing the source on any webpage (Click CTRL + U on your keyboard) you can check to see how many times the H1 heading tag is used. 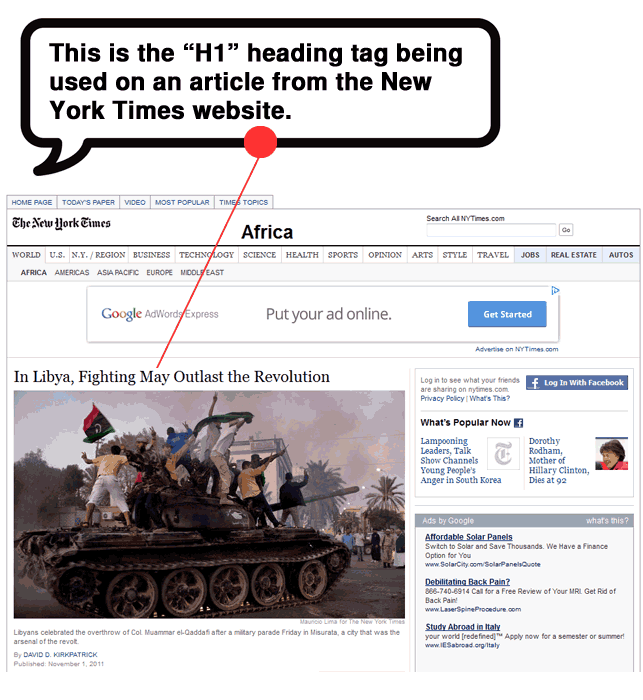 Remember, you only want the H1 heading tag to be used ONCE per page. Simply search for H1 or h1 using your browser’s search function. You can search by pressing CTRL + F (control and then the letter “F”) on your keyboard. Again, type in H1 and see how many times it appears in the source code. It should only appear twice: once for the opening H1 tag an once for the closing H1 tag. If the H1 tag appears more than once, then your webpage is not optimized well. You should have your developer modify your website to only use the H1 heading tag once per page. Old versions of WordPress will place the H1 heading tag in the header logo. The problem with this that the same H1 text is used on every page. This is not optimal. Again, you want your H1 heading tag text to match your title tag text as much as possible (which means you will have different H1 text on every page – like it should be!). There are ways to work around this, but it usually requires you to modify your WordPress .php files. Contact us for help with this. You can also upgrade WordPress to a newer version to solve this problem.